The Jammu and Kashmir Board of Secondary Education (JKBOSE) conducts the exam for 10th Class students in the state every year. After the completion of examinations, the board will announce the JKBOSE 10th result. The JKBOSE 10th result 2019 will be tentatively declared by the first week of May. The JKBOSE Class 10 result 2019 will also be published online on their official website once it is formally announced. The publishing of the JKBOSE Class 10 result 2019 online will make it more convenient for the students to check the same. JagranJosh will provide a live link to check the JKBOSE 10th result 2019 on this page as an alternative option for the students to check their result. Students should, thus, bookmark this page for all the latest updates and information about JKBOSE 10th result 2019. The date sheet for the summer zone examination of JKBOSE Class 10th has already been released by the board. However, JKBOSE has maintained a complete silence when it comes to announcing the JKBOSE 10th Result 2019 date. The JK Board usually takes 50 to 60 days to release the results, once the examination is completed. Considering this and taking cue from last year, the JKBOSE Class 10 result 2019 is likely to be declared by the first week of May (summer zone). Senior academicians suggest that the Jammu and Kashmir result 2019 will be announced as per their annual academic calendar. Once announced, the students will be able to check the result on the official website. The declaration date of JKBOSE Class 10 result is yet under speculation and the board is likely to come up with the official notification of the JK Board Result date soon. Our team would provide all updates about the JKBOSE Class 10 Result 2019 here on this page. You can also register for our email alerts service to receive all updates about JKBOSE 10th result 2019 directly in your inbox. Fill in the form provided at the top of this page to avail this service. Where to check JKBOSE 10th Result 2019? Once the results of the JKBOSE 10th Board 2019 are declared, the students will be able to check them online on the official website of the board i.e. jkbose.co.in. These JKBOSE results will also be available on Jagranjosh.com and the students will be able to check right here on this page. While their mark sheets and passing certificates will be available only after one month from the date of announcement of results at their respective schools, the students can download the scorecard online for their immediate usage. As we are discussing about this year's JKBOSE Class 10 results, it is important for us to understand the result pattern. For this, we are sharing some interesting and useful statistics of previous years to help you understand the pattern and anticipate the JKBOSE 10th Result 2019. Here, we are listing the JKBOSE 10th Class Result statistics for the year 2018. It will provide the students with details about the number of candidates appeared in the examination, passing percentage of girls and boys and overall passing percentage. 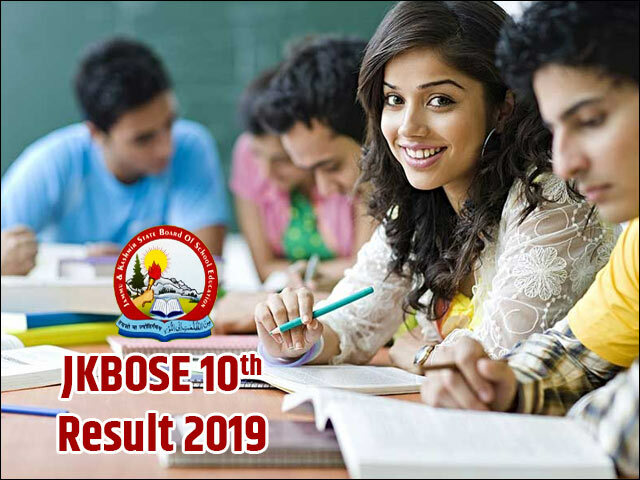 How to Check JKBOSE 10th Results 2019? If you wish to avoid all the misinformation and rumours about the JKBOSE 10th exam and result 2019, than you must subscribe to our website. To start receiving these updates, you need to fill up the form provided at the top with crucial information such as name, school name, examination roll number, subject name, region name or any other details. What after JKBOSE 10th Class Result 2019? Students must check and download and take a printout of the JKBOSE Class 10 2019 result page for future purposes. The JKBOSE Class 10 Result 2019 will be available through the link provided above. The downloaded copy of the JKBOSE 10th result 2019 is meant to act as a provisional status of qualification until the original marksheet are issued by JKBOSE. The original mark sheets will be delivered to the respective schools within the stipulated time after the declaration of JKBOSE Class 10 2019 Result. The declaration of JKBOSE 10th result 2019 will bring joy and relief to some while others may be disappointed with the way they fare in the exam. If a student feels that the marks he/she has obtained in the examination are not right, then he/she can apply for re-evaluation. The students can take benefit of this particular provision by paying a nominal fee as directed by the concerned and submitting an application through their respective schools/institutions. Students who fail to secure passing marks in the JKBOSE 10th result 2019 despite their best efforts can appear for JKBOSE Supplementary/Improvement Exam for Class 10. This exam gives the candidates with a second chance to improve their scores in a single or multiple subject(s). Students can apply for appearing in the supplementary/improvement exam of JKBOSE Class 10 by filling in the application form that will be made available on the official website. The Jammu and Kashmir Board organises examinations for the 10th Class students all over the state. The students, who appear for the 10th Class examination, whether studying in private or government schools, are affiliated to Jammu and Kashmir Board. The Jammu and Kashmir Board of Secondary Education has been formed in the year 1975; from then onwards the board has taken the responsibility to conduct final examinations for 10th standard students. Apart from conduction of examinations, they also take the responsibilities to provide facilities such as computer labs, library and sports equipment. The Jammu and Kashmir Board is giving high-class education to all the students in the state of Jammu and Kashmir. Each year the Jammu and Kashmir Board carries out Class 10th and Class 12th Examinations. There are a lot of private as well as administrative schools get affiliated with the Jammu and Kashmir Board. The Jammu and Kashmir Board offers all types of education associated facilities to the students, who are taking education under this board. Jammu & Kashmir State Board of School Education has released the re-evaluation result of class 10 exam for winter zone of Jammu on 18 March. JKBOSE 10th Result 2018 has been declared for Kargil Division for both Regular as well as Private candidates on official website jkbose.ac.in. Get all the details about JKBOSE 10th Result 2018 here. JKBOSE 10th Exam 2019 Date Sheet for Jammu Province has been released by the Board. The JKBOSE 10th Class Exam for SSC students will begin on 27th Feb and conclude on 19th March 2019. Get complete datesheet for JKBOSE 10th Exam here.